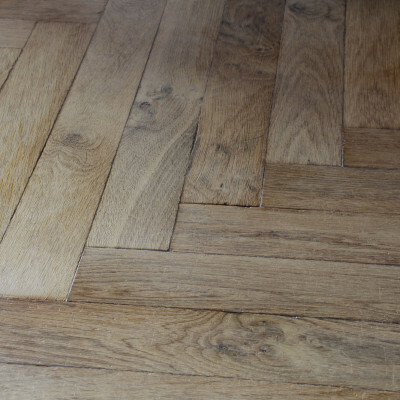 OPERA - Herringbone - Antiqued massive oak parquet. Cognac tone. Length : 28 in ; Width : 4,7 in ; Thickness 3/4 in. We find in the residences, the laying called "Herringbone" since the 18th century. It reproduces the same pattern as the "Hungarian point" but is distinguished because the extremity of the frieze is straight instead of having a miter cut, forming an internal angle and salient angle.